1 of 3 In a medium-size heavy-bottomed saucepan, whisk together the sugar, cornstarch, cocoa powder and nutmeg. Gradually add milk, whisking constantly to keep mixture from getting lumpy. 2 of 3 Transfer saucepan to stovetop, and heat over medium heat, stirring constantly with a wooden spoon. Bring to a boil (about 10 minutes), then boil 2 minutes. 3 of 3 Remove from heat and add chopped chocolate. Stir until all pieces are melted. Stir in vanilla. Strain into a large bowl, then either cover surface with plastic wrap or divide into individual cups and cover. Refrigerate until cold, about 2 hours. 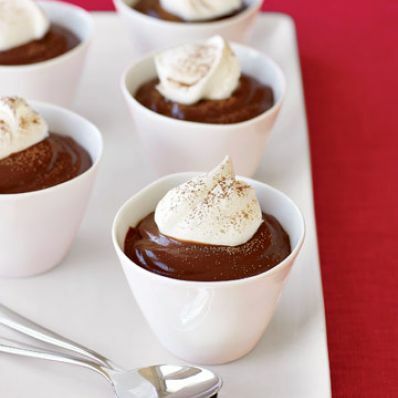 Serve with whipped cream or whipped topping, dusted with cocoa, if desired. Per Serving: 2 g fiber, 72 mg sodium, 12 g Fat, total, 20 mg chol., 8 g sat. fat, 328 kcal cal., 6 g pro., 49 g carb.